Razor sharp fangs, immense size, malicious intent, practically immortal, regenerating heads and growing stronger by the minute. Hopefully I have painted a picture of a monster, specifically the ancient lernaean Hydra. Monsters come in all shapes and sizes from shapeshifters, to vampires, to zombies, to dragons, to giant multi headed serpents. They are not born but rather created by society during times of the current cultural feeling. According to Jeffrey Jerome Cohen, the author of the Gothic horror Monster culture (seven theses), “The monster is born only at this metaphoric crossroads, as an embodiment of a certain cultural moment of a time, a feeling, and a place” (Cohen 4). In other words monsters are created by society. They are created during the current times of fears, feelings and beliefs of cultures. With this in mind, we can analyze in depth what the current beliefs and feelings were during Ancient Greece. we can understand what the purpose of the Hydra was, and ultimately how it relates to Cohen’s theses’. According to Greek mythology, the Lernaean hydra is described to be a multi headed water serpent that dwelled near the well of Amymone, south of Argos in Greece. The region itself possesses many springs, lakes, marshes and other bodies of water, which were believed to be gifts from Poseidon. Lerna and was also notoriously believed a place of mystery, with many mythical folklore surrounding its mention. As one children of Echidna and Typhoeus, the mother and father of monsters respectively, the hydra was believed to be the guardian of the underworld (Felton). It makes sense as to why a monster would be created here. Relating to the fifth monster theory, Cohen writes, “the monster stands as a warning against exploration of its uncertain demesnes” (Cohen 12). In other worlds the hydra was created to police the borders of exploration. It was created so that it could instill fear in people to not explore the lakes and springs of Lerna. However, this did not stop Hercules. Perhaps one of the most notable fables of the hydra would be its encounter with Hercules. More specifically, the second labor of Hercules. According to legend, Hercules was sent by the gods on twelve dangerous labors to atone for the murders of his wife and children. One of these labors consisted of purging the hydra of lerna. Hercules quickly learned that severing the heads would not work. To make matters worse, the greek goddess Hera, sent crab like monster, names cancer.. Yes cancer, to aid the hydra in killing Hercules. With the help of Iolaus who cauterized the heads after each head was cut, Hercules emerged victorious (Felton). If you ask me, anyone crazy enough to go toe to toe with any monster especially on its home turf is a crazy person. Never mind how beefy Hercules or whether or not he’s a god, anyone who takes on a two monsters guarding what is essentially the gates of hell is an insane mother fucker. Occasionally, when the beast had to feed, it terrorized nearby towns and villages leaving nothing but destruction and a poisonous trail. The hydra’s physical appearance is described to be serpent like in nature. The hydra also has the very typical monster qualities such as razor sharp teeth, toxic breath and extremely venomous blood (Hydra – Mythological Greek Hydra). It goes without saying a drop of blood or a whiff of its breath is lethal. As far as overall size goes, the hydra is said to be no taller than an average sized man. But on the other hand, the heads are described to stand tall and tower over even the tallest men. Hollywood and others tend to ignore this and falsely portray the hydra as a mega sized monster. The most defining feature of the lernaean hydra was its multiple heads. Aforementioned above, the hydra is believed to have up to 9 heads, though many other accounts claim that it has up to 100 heads. However many heads the beast had, It always had a head larger than the others which would be immortal (HYDRA LERNAIA). On top of that, the hydra possessed the ability to regenerate severed heads. For every head cut, two more would grow back. The lernaean hydra has been a popular choice for Greek mythology movies and video games. Its appearance serves mainly as a minor a boss fight, a filler so to speak, and never the main antagonist. Take for example Disney’s Hercules. The battle between Hercules and the 90’s era computer animated hydra served only as a story filler. The scene was based off the of the original mythological story with some major altercations. Instead of being sent by Hera to terrorize the Greek countryside like in the myology, it was sent by Hades to kill Hercules. In the popular God of War franchise, Kratos, the god of war, is sent by Poseidon to slay the hydra who was challenging the right of the sea. Finally, In the Percy Jackson series, the hydra makes an minor character appearance. Each interaction portrays the hydra differently. Some with different varying amounts of heads and others with the hydra able to breath fire. It seems to be a popular theme for Hollywood to twist and turn the appearance and abilities of the hydra. In 2018, we laugh at the idea of a sea creature with multiple heads. We scoff at the idea of a man sized monster with toxic breath and blood and quick ability to regenerate its heads and with good reason too. Why? Because science disproves the existence of the hydra. However with all things fiction or not, there is something to learn. Cohen writes that “These monsters ask us how we perceive the world, and how we have misrepresented what we have attempted to place. They ask us to evaluate our culture assumptions about race, gender, sexuality, our perception of difference, our tolerance towards its expression. They ask you why we have created them” (Cohen 20). Basically, monsters come back to challenge our current knowledge. They come back reevaluate our current feelings, thoughts and perceptions about our current society. What does the Hydra mean today? Today, the lernaean hydra exists as a constellation in the stars and is also used as a metaphor to describe problems ongoing worsening problems of today. Similar to the “snowball effect”, The so called “Hydra effect” is used as a metaphor for problems that grow worse after every solution, such as the war on terror and war on drugs. Every solution that seems viable actually worsens the situation. Eventually it’s all downhill from there. Monsters are not always what they seem. All monsters are created by humans. They decide what is normal and call anything outside a monster. These monsters are set to patrol boundaries that should not be crossed, others to be describe the current feelings of a culture. As time passes, these monsters that were so feared back then often become laughing stalks or popular references for movies or video games. Which ever their fate occurs in the future, these monsters eventually resurface in order to challenge what we know. B., G. “Hydra.” The Classical Tradition, edited by Anthony Grafton, et al., Harvard University Press, 1st edition, 2010. Credo Reference, https://search.credoreference.com/content/entry/harvardct/hydra/0?institutionId=5312. Accessed 27 July. 2018. This scholarly source explains the origin and mythology of the lernaean hydra. It focuses on the twelve labors of Hercules and its encounter with the Hydra. This source is going to be used for its information on the mythology. This source was also found on credo search. Cohen, Jeffrey Jerome. “Monster culture (seven theses).” Gothic horror: A guide for students and readers (2007): 198-217. This sources goes on to explain the 7 monster theses that we have been learning in class. The sources explains who, where, how, and why monsters are created. This sources was provided by the instructor. I plan to use this in my article for its knowledge of the aspects of monsters. This article was found on google scholar and was provided by the instructor. Felton, D. “Hydra.” The Ashgate Encyclopedia of Literary and Cinematic Monsters, Jeffrey Andrew Weinstock, Ashgate Publishing, 1st edition, 2014. Credo Reference, https://search.credoreference.com/content/entry/ashgtmonster/hydra/0?institutionId=5312. Accessed 18 July. 2018. This source covers the origin history of the Lernaean Hydra. 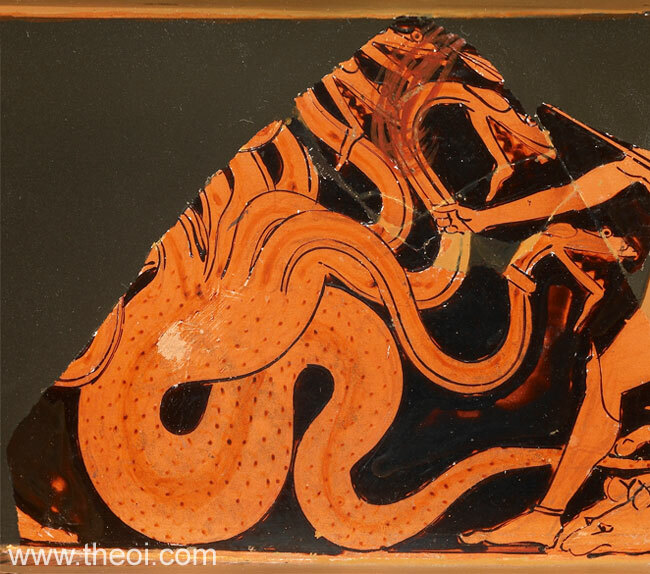 The source details the Hydra’s encounter with Hercules as well as other notable encounters throughout greek mythology. I plan to use this in my article for the history and information about origin. This source was retrieved from Credo search. It was written by D. Felton. “HYDRA LERNAIA.” IRENE (Eirene) – Greek Goddess Hora of Peace (Roman Pax), www.theoi.com/Ther/DrakonHydra.html. This source also covers the background history of the Lernean Hydra. It encompasses the many in Greek mythology stories giving specific quotes to describe the hydra. I plan to use this source for its stories and reinforce my argument. This source was found on google and was published by theoi.com. “Hydra – Mythological Greek Hydra.” Go to Legends and Chronicles., www.legendsandchronicles.com/mythological-greek-creatures/hydra/. This source covers the appearance and and mythology of the Hydra. The source also includes the creatures abilities and features. I plan to use this source for its physical description of the creature as well as some history. This source was found on google and was published by legends and chronicles.